Have you heard of High Sierra Music Festival, or even Quincy, California for that matter? Quincy, California is located in Plumas County, California, about an hour and a half away from Reno, Nevada. 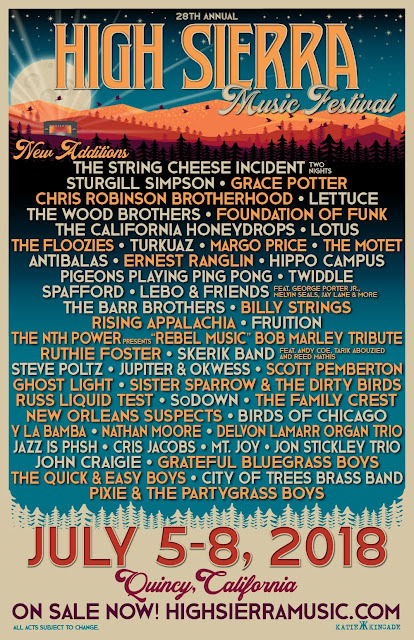 High Sierra Music Festival is a four-day camping festival held in the beautiful Sierra Nevada mountains and the Plumas National Forest. It will be held July 4-8 and this will be their 28th year! High Sierra is family-friendly, and also has late night shows all four nights. This is a festival where you can celebrate just being yourself. Go all out with costumes or just wear whatever you want! Theme nights include: Whimsical Woodland Wingding, Exotical Nautical Voyage, Fancy Shmancy Soiree, and Flowah Powah Gala. This festival supports giving back to the community locally and nationally. There will be an "Art That Feeds" food drive with Conscious Alliance, where you can exchange foods for an event poster. Their posters are always amazing. This year, there will be multiple nonprofits that you can learn about and get involved with if you choose. This year, you can tackle issues such as getting registered to vote, sober living and addiction recovery, fighting cancer by donating bone marrow, At the Shabbat tent you can share food and experiences, celebrate Shabbat, charge your phone, and participate in Kabbalistic meditation! High Sierra is affectionately known as "Land Cruise" because the amazing lineup is similar to Jam Cruise. 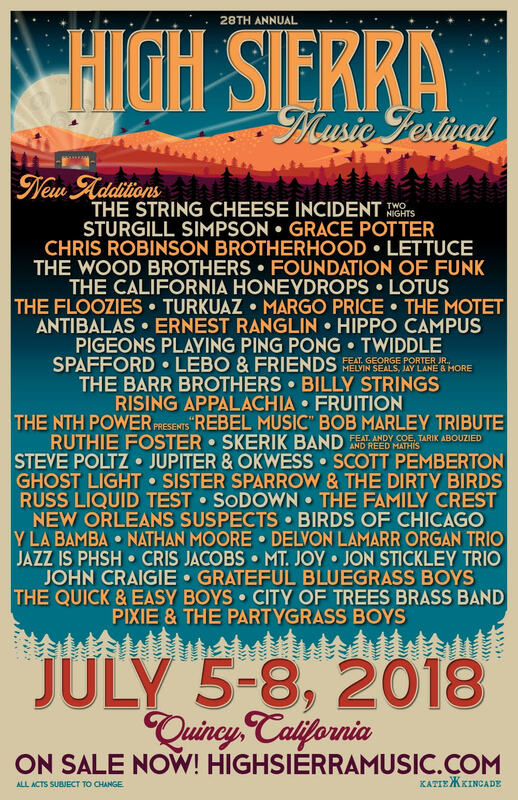 This year, headliners include String Cheese Incident, Grace Potter, and Sturgill Simpson. The rest of the lineup is also a generous gift. The California Honeydrops is a blues and R&B band from California. They are known for their deep soul and funky jams. They started out in subway stations and now continue playing anywhere from intimate venues to huge festivals. The California Honeydrops are as fun on the stage as they are in the crowd. They are known to get out and dance in the audience when their set is over. Their goal is to make the audience dance and sing, and they achieve their goal every single time! This is a set that should not be missed. The Wood Brothers is a trio consisting of Chris Wood (from Medeski, Martin, and Wood) who plays upright bass and has serious dance moves, Oliver Wood who plays bass and acoustic guitar and is the lead singer, and Jano Rix who plays multiple instruments but is mostly seen drumming. Chris and Oliver Wood are from Boulder, CO, originally. This band sings about everything: family, floods, relationships, happiness, sadness, truth. They are the perfect music for any mood. They recently released their new album One Drop of Truth, which Oliver says is the "most purely Wood Brothers album we've ever made." Turkuaz is a rainbow of brilliance that you didn't even know you needed. They are a nine-piece, extremely talented and colorful band that is gaining the recognition they deserve at a super fast pace. Everyone in the band is beautifully clad in their respective colors. Some of them even have dyed their hair to match their outfits! They are a rock, funk, and self-proclaimed "Powerfunk" band. They will have you in awe of their talent and the ability to make you dance before you even realize you're dancing. Ghostlight is a relatively new band. They started out recording first and are now performing live shows! Holly Bowling is known for her exceptional piano playing, and Tom Hamilton is known for his guitar playing with Electron, Brothers Past, American Babies, and Joe Russo's Almost Dead. This band is made up of 5 super talented musicians. Don't miss their two live performances at this festival! The Motet is a Denver-based seven-piece funk, soul, groove, and improv band that is guaranteed to make you dance (and sing once you know the words). Their goal is to provide an escape for their listeners. Drummer Dave Watts said, "When you're listening to us, I want your mind to be taken away from wherever you are during the day and into some other place. It's all about that." This band does that well. No matter what you're feeling, the Motet makes you feel better, let loose, and just dance! 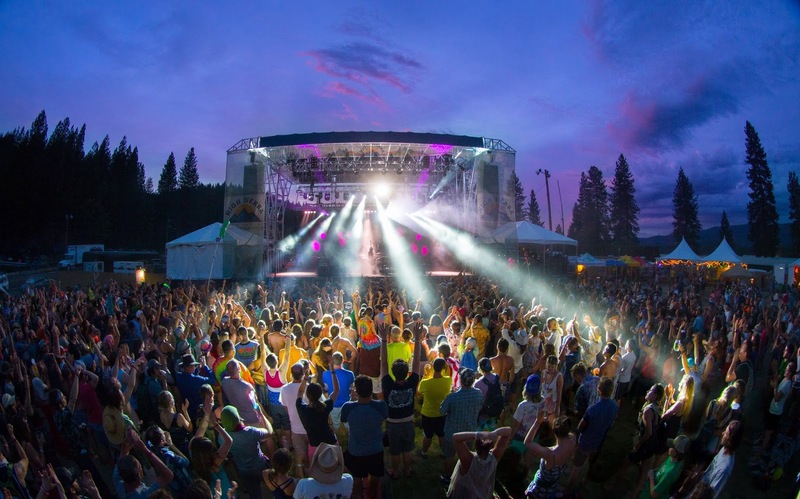 Don't miss High Sierra Music Festival this year!